Up until Tuesday night, Democratic presidential candidate Bernie Sanders seemed to mostly be riding the coattails of his rival Hillary Clinton. But with Sanders winning big Tuesday night in New Hampshire, the senator from Vermont made a crucial step toward the nomination. Sanders' win is an upset for Clinton, who won the state eight years ago against Barack Obama and narrowly came first in the Iowa caucuses last week. Though Sanders hasn't always been a frontrunner, it looks like his appeal reaches far and wide, garnering the majority of his support from men, women, and independents. So how is it that Fox News anchor Megyn Kelly still managed to butcher his name during live coverage of the New Hampshire primary, pronouncing Sanders' name "Sandals"? "On the Democratic side" Kelly said, "Bernie Sandals — Sanders — Sandals could catch on in the summer months." Of course, the flub created a ton of Bernie Sandals memes. Kelly's coworkers giggled, and so did the rest of America — it's no doubt an honest mistake, but it looks like the flub has caught on and won't be leaving any time soon. From the onslaught of Twitter memes featuring "Bernie Sandals" to the media frenzy poking fun at Kelly, there's definitely no shortage of "Sandals" on social media recently. So join in on the New Hampshire celebration in true style by grabbing a pair of "Bernie Sandals" possibly coming soon to a White House near you. Looks like they come in stylish red and blue colors. Talk about bipartisan? And what would "Bernie Sandals" be without stern Sanders standing up for his political platforms. Sanders' supporters have really kicked it up a notch this time on Twitter. Because if there's one thing Bernie fans are good at, it's making sure you #FeelTheBern. Even the man himself is seen sporting the good ol' Sandals. If you're feeling the need to wear different Sanders' facial expressions, these shoes have got your back. If you didn't think these sandals could be any more unattractive, think twice — you'll also be sporting the classic Sander's mid-sentence look. 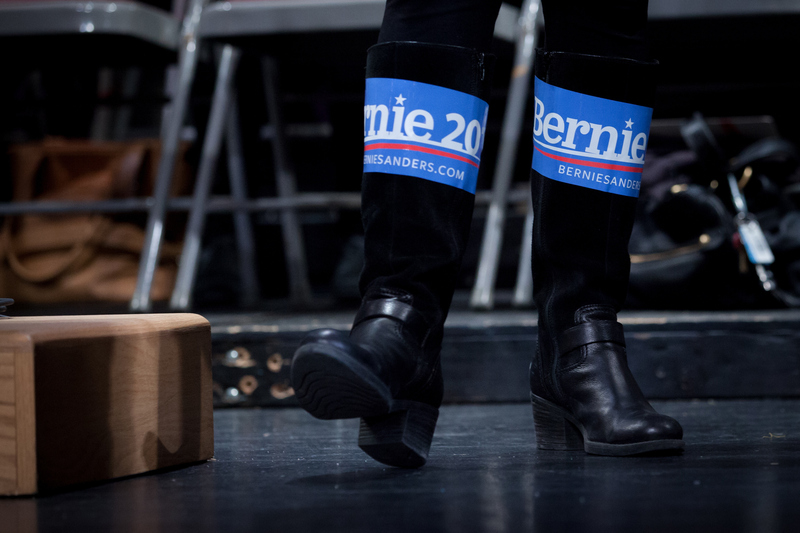 And there's even high-quality leather "Bernie Sandals" for those feeling fancy. ... And this is where it just begins to get creepy. Out of all the "Bernie Sandals" designs out there, these really take the cake. Not only are they patriotic, but they also feature Sander's 2016 run front and center — the perfect Bernie-mentum combination.